Within the COMSODE project Spinque applied its Search by Strategy approach to Open Data. We successfully extended the approach to Linked Open Data and we demonstrated the technology through several search applications. At the end of the project we are very pleased with the result and we are grateful that we got the chance to help the Open Data community a bit forward within the Comsode project. This blog post is the third and final part in a series of posts on creating advanced search applications with Spinque and the Open Data Node. We go to the beginning of the chain and describe the transformation and publication of the datasets itself. Using the Open Data Node we transformed, integrated and published five datasets. In a previous blog post, we introduced CultuurLINK as a service for the cultural heritage community to integrate collections by linking their controlled vocabularies. As an example we showed how to connect the internal subject term list from the NIOD Institute for War, Holocaust and Genocide Studies with a large audio visual thesaurus (GTAA) from the Netherlands Institute for Sound and Vision. Today, we put these newly created links into action. Linked Open Images is a mobile application to explore historic material about World War II that gives access to three Open Data collections: historic (1) Dutch news reels shared by Sound and Vision and (2) Photographs and (3) Books shared by NIOD. In this post, we explain how we build a prototype application on top of three linked datasets. We detail how the required backend services combine information from multiple sources and how we constructed these services with Spinque. 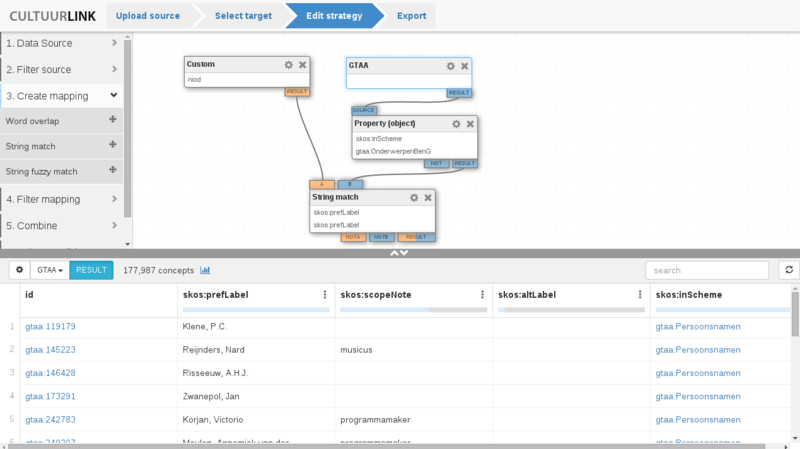 Using Spinque’s search by strategy approach, we were able to create all required backend functionality by constructing strategies in the graphical editor; not a single line of code had to be written!